The Ruslyn Cord and Pack Reel is designed for military use as a handheld, small, rugged and lightweight mini reel that can be carried during operations. The Ruslyn Pack Reel® is designed to handle hook & line, flexible coaxial cable, detonator cord, firing cable, signals cable, aerial cable, paracord, rope, hose, and wire. This small rugged and lightweight handheld reel it is specifically designed for the dismounted soldier. It is used by combat engineers, search, EOD, CIED, special operations, sigs and clearance divers. 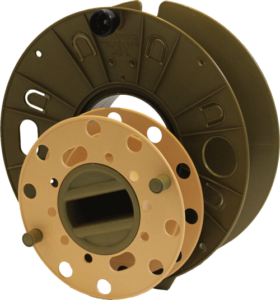 The Ruslyn Pack Reel® is also used by emergency services, homeland security, law enforcement and industry. The center hand grip is designed for use with a gloved hand in sub-zero temperatures. The Ruslyn Pack Reel® has been tried and proven on battlefields around the world. 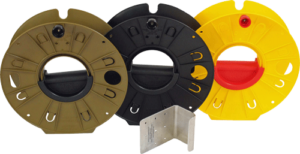 Rojone can supply the Ruslyn cord and pack reel already fitted with your customised cable assembly.